The above dignitaries and representatives participated in the wreath presentation portion of this historic event and are standing in front of the original law office of Judge Paul Carrington along with the newly dedicated stone marker in front. On April 28, 2018, VA OFPA Associate Carl Bess Jr. presented two OFPA National Guard Awards at the 2018 Virginia National Guard Convention in Norfolk, Virginia. 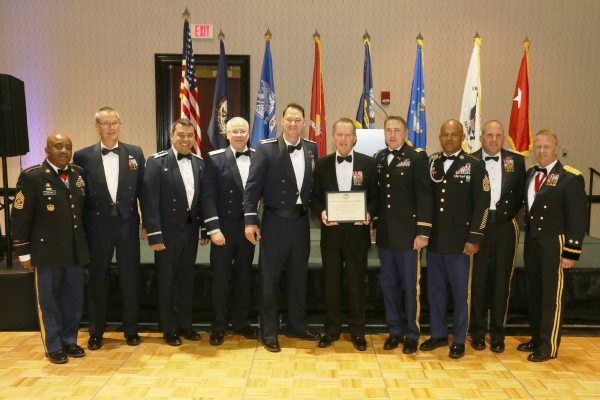 This year's awards went to the 192d Intelligence Squadron and B Company, 1-116th. Both of the units were chosen by the Virginia National Guard's respective Air and Army commands. Associate Bess was asked to present these awards along with some brief words at the main dinner event instead of the much smaller awards ceremony preceding the dinner. Quite an impressive gathering! From left to right are: CSM Johnson, Command CMSgt Ellis, Col Lobash, Brig Gen Kjelvik, Maj Daniels, VA OFPA Associate Carl Bess Jr, MAJ Nivens, CSM Reed, BG Mercer, and MG Williams (The Adjutant General for Virginia). 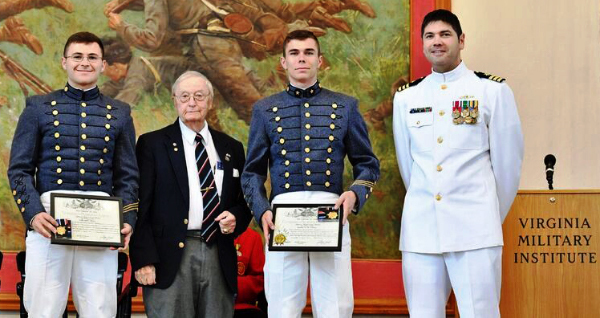 On April 27, 2018, Virginia OFPA Life Associate Richard Raymond presented two Navy ROTC awards at the historic Virginia Military Institute (VMI) located in Lexington, Virginia. The individuals receiving the awards were MIDN 1/C Cody James Rioux and MIDN 1/C Thomas A. M. Schmitt. From left to right are: MIDN 1/C Cody James Rioux, Life Associate Richard Raymond, MIDN 1/C Thomas A. M. Schmitt and the Executive Officer CDR Dan Turbeville.